Forty years after his death by suicide in 1970, Mark Rothko seems to be everywhere. Recent exhibitions of his work have been mounted in Moscow and at the National Gallery of Art in Washington. 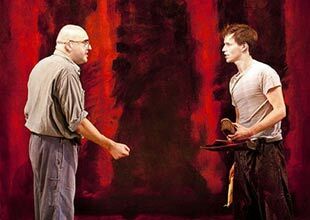 “Red,” the John Logan play that explores an especially tumultuous period in the artist’s life, is currently on Broadway and received six Tony Awards, including one for best play. 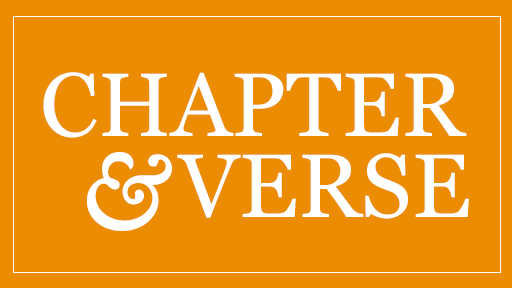 In September, Yale University Press will publish The Rothko Chapel: Writings on Art and the Threshold of the Divine by Dominique de Menil, a Rothko patron who commissioned him to create the paintings for the famous interfaith chapel her family established in Houston. Mark Rothko was born Marcus Rothkowitz in 1903 in Dvinsk, now Latvia but then a part of imperial Russia. He was the youngest of four children. His father, a pharmacist, and two older brothers immigrated to the United States in 1910 and settled in Portland, Oregon. The rest of the family joined them in 1913, and Rothko’s father died less than a year later. In 1921, Rothko entered Yale on a scholarship but left in 1923 without a degree and moved to Manhattan, drawn both to the theater and to art. He joined the Art Students League, began taking classes, and in 1928 was selected by a League instructor to show some of his work, mostly landscapes, in a group show—his first exhibition. In the mid-1950s, Rothko discovered and read the Christian existentialist Soren Kierkegaard, especially Fear and Trembling, Kierkegaard’s interpretation of the sacrifice of Isaac story in Genesis 22. Rothko told one friend he “completely identified” with Kierkegaard’s portrait of Abraham as an artist. “Abraham’s act was absolutely unique,” Rothko said in a 1958 address to the Pratt Institute. “What Abraham did was understandable; there was no universal law that condones such an act as Abraham had to carry out,’’ adding that “as soon as an act is made by an individual, it becomes universal. This is like the role of the artist.” Art critic Dore Ashton, Rothko’s friend and biographer, has argued as well that Dostoyevsky’s struggle between faith and doubt helped the painter in his own struggle to maintain his faith in art. Rothko was a complex and contradictory human being, at times shy and reserved, at other times gregarious and arrogant. He could be charming or brusque, accessible or remote. He seemed deeply affected by his sense of being an immigrant, yet he did not become a US citizen until 1940, at about the same time he changed his name. He also seemed to regard his Jewishness as giving him outsider status. He vigorously resisted being categorized as a Jewish painter and would not, unlike some of his colleagues, accept synagogue commissions. He both scorned and longed for commercial success. The emotional agony he endured in accepting and then rejecting the commission for the so-called Seagram murals at the Four Seasons restaurant in New York’s Seagram Building—the episode around which Logan builds his play—is only the most extreme example of Rothko’s ambivalent attitude toward his paintings’ place in the world once they left the studio and in what kind of environment they should be viewed. Equally complex and contradictory are the religious and spiritual threads that run through Rothko’s commentary on art and life, as well as the response of critics and lay viewers to his work and words. It is impossible to speak with comprehensiveness about Rothko’s personal religious views or to precisely impute particular religious narratives to his classic abstract works. He would, at different times, both affirm and deny their religiosity or spirituality, just as he denied that he was either an abstract or expressionist painter. Rothko’s rectangles developed after a long maturation process, in which his painting moved from an expressionist-grounded realism, through a surrealism in which classical, mythological, and Christian subjects provided the ground for exploring the unconscious, to the final form he arrived at with his breakthrough work in 1949 that culminated in the dark murals for the Houston chapel, painted between 1964 and 1967—“imageless art that sought great religious and moral depth,” as John Cook, now professor emeritus of religion and the arts at Yale University, has written. While Rothko was concerned about the moral and religious content of his work from the beginning, his classic period arrived a moment in the history of art and religion in American culture when both were in crisis. Post-war America, in its burst of affluence, was going through what many saw as a secularization process, while art was experiencing a crisis of representation following the exhaustion of Social Realism (William Gropper) and American Scene painting (Thomas Hart Benton). Rothko’s response was to try to figure his sense of the discomforting of transcendence without figuration, in the pure abstraction of luminous rectangles and their sensuous suggestion of portals, their hint that something existed, perhaps a kind of light, behind the surface. By emptying the canvas of obvious story Rothko could paint a more emotionally accurate “portrait of the soul,” as he sometimes called his paintings. 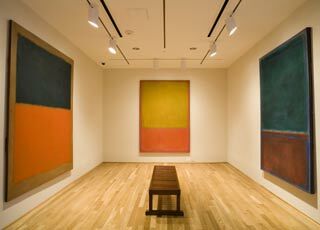 The Rothko Room at The Phillips Collection, Washington, D.C.
Like listening to a John Coltrane solo, seeing Rothko’s rectangles is always surprising. They may appear calm, even serene, inviting restful contemplation, but they are far more demanding. They require sustained attention, and what at first appears to be stillness is actually very alive, almost pulsating in the soft, undefined borders between the colors and the edges of the paintings. In his “Green and Tangerine on Red” at the Phillips Collection in Washington, the blocks of color invite you into an intimacy that draws you out of yourself, but at the same time the size of the painting requires you to keep your distance. There is the sense of a presence—beyond, behind, within—but it is invisible, ineffable. The paintings seem to be declaring, at least in part, the spirituality of sensuality—that materiality can glow with a transcendence that gives it a meaning without denying its physicality. Repeated encounters with what seems a repetitive motif are, in fact, different, and one’s response is altered every time. It is not true that if you’ve seen one Rothko you’ve seen them all, for each one offers a varying degree of the knowable but unnameable experience. “Religious imagery—which had attracted Rothko for the themes it addressed—especially lent itself to being transposed into abstract emblematic forms, because sacred art is particularly tradition-bound or prone to formal conventions,” Chave suggests. Rothko once described the ideal display situation for his paintings as one work alone in a “kind of wayside chapel, not one in the city where you could just drop in, but more out of the way, a destination, outside the city.” His culminating work was, indeed, meant for just such a place. 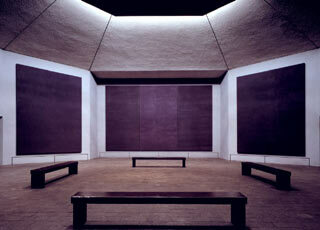 Originally intended to be a Roman Catholic chapel on the grounds of the University of St. Thomas in Houston, the sacred space now known as the Rothko Chapel is independent and ecumenical. 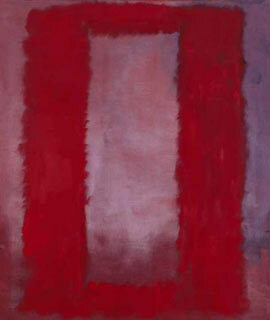 For the octagonal plan designed by Philip Johnson, Rothko created a suite of 14 paintings, including three triptychs. Chave reads Rothko as using the conventions of the Stations of the Cross, altarpieces, and the architecture of a Christian Orthodox church. 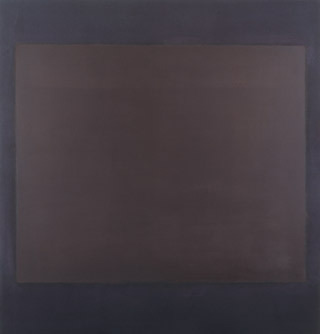 Seven of the paintings are a dark, mottled blackish purple color; four—a triptych and a single painting—hold a greenish black rectangle set against a reddish black background, and three involve a black background and green rectangle with a darker green form inside it.